Borrowing money from a family member or a friend seems easier and more flexible than trying to get a loan from a bank or another financial institution. However, adding money to any friendship can be a real recipe for a disaster. Before you ask your friend for a loan, consider first whether it is your best and final option. Unfortunately, for another person, asking money from her friend is not only an option: it’s her friend’s obligation to help her while in need. 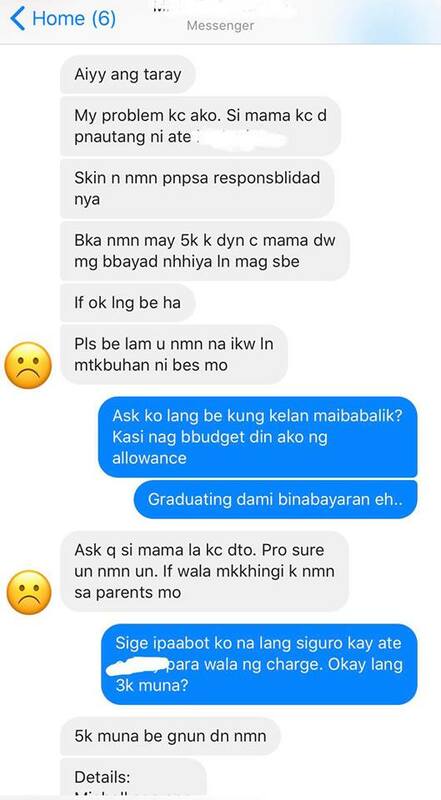 This person’s best friend, who has been helping her even during their college days, was fed up after the other party blocked her when she refused to lend her the amount that she needs. Unlike other “lending money” stories, this one is different: the lender kept on giving money to the borrower, thinking that she is helping a friend who is always in need. The story started with the unnamed friend asking Facebook user Shirlyn to lend her money since her mother failed to give her some allowance. Shirlyn asked her if she can give it the week after since she’s still waiting for her money. 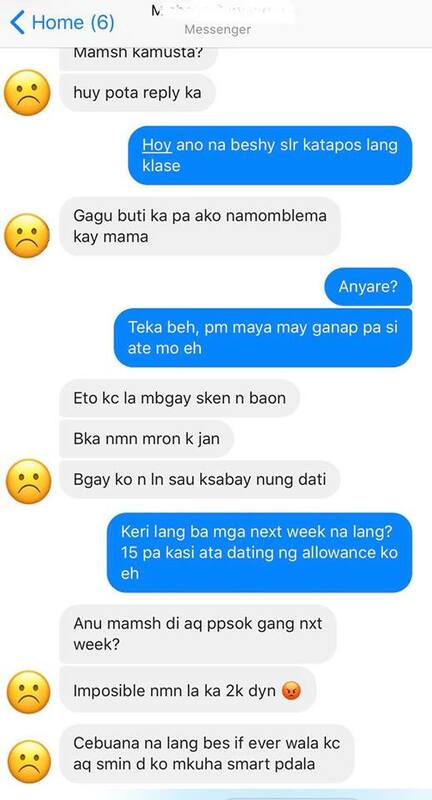 Instead of saying “yes” or she understands, the said friend even demanded her to send the money via money remittance since it’s impossible for her not to have P2,000. Since Shirlyn will go back to Qatar, her friend asked her to lend her boyfriend to her since she also wants someone who would buy her makeup. Even if she’s already outside the country, the said person is still asking her for money. The last straw happened when her “friend” is loaning her iPhone 6 to Shirlyn, which she refused since nobody will use the said phone. Thinking that she’s already rejected, the said person said derogatory words to her. She even came to a point when everything that is happening to her life, she is pinpointing her friends as the problem. Ksalanan nio nmn lht yn not me. Kyo ang may prblema. Konting long lng pde nmn hmindi dmi p cnasabd. 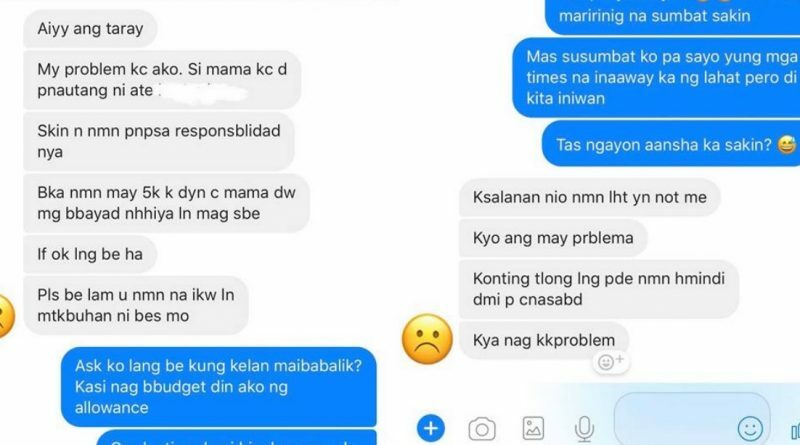 Kya nag kkproblem. The said person also blocked her on Facebook. It is really saddening to know that relationships and friendships break because of money. Have you had the same experience before? If you’re in Shirlyn’s shoes, what will you do?